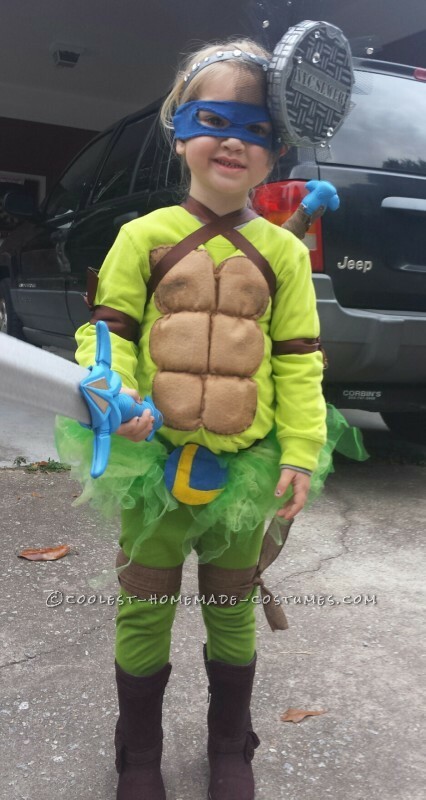 My four year-old daughter has always chosen non-traditionally gendered costumes (Thomas the Train, Buzz Lightyear and now a Ninja Turtle), so we have always chosen to make rather than purchase. She is still very much a girly girl but our only option this year was to purchase a boys costume or the “girl” version which was a sequined dress with a sparkly “shell” only on the front and a shiny mask; basically, the tiny stripper version. 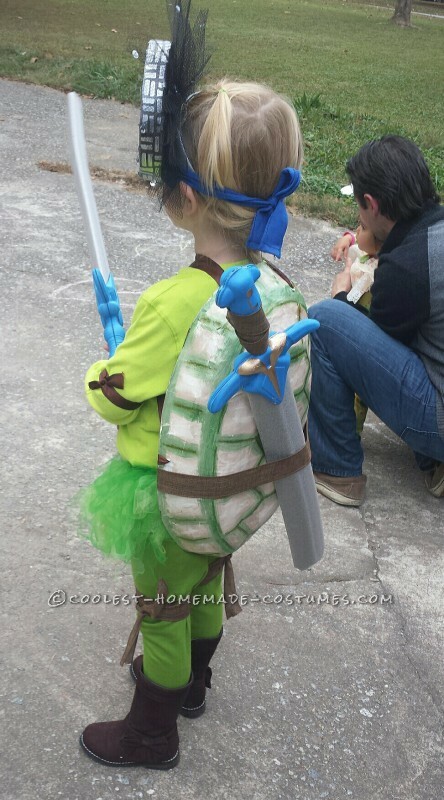 I started by paper mache-ing a turkey pan, then popping it out and painting the turtle shell. Then I cut the front shell out of felt, padded with more felt and sowed it onto a green shirt and finished by painting it with a little fabric paint (mostly because the hot glue melted some of the felt and I had to cover it up). I took a piece of floral form, covered it in duct tape, stenciled and painted it and then added toile and rhinestones before securing it to a headband to make the manhole cover. I used wired and regular brown ribbon to wrap her legs and arms and we bought a mask and then backed it with more felt because it was a little flimsy. I gold leafed some of the accents on the swords we bought and then secured one to the shell so she would only have the worry about carrying one of them. I bought a stretchy headband and tied stripes of toile to it to make the tutu and made a small “L” out of felt for the utility belt. It was a huge hit. 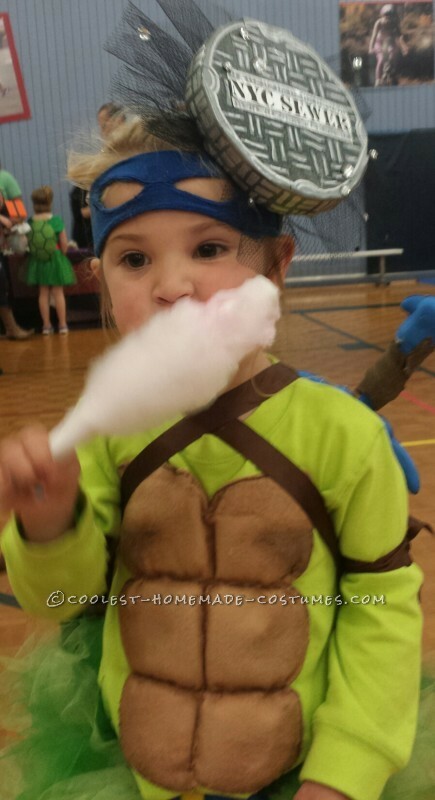 Obviously, Ninja Turtle was a very popular choice. She was probably one of so many at any parties we went to, but everyone was so happy to see that she was a girly version of one. We got a lot of props on creativity and even her little girl friends that all went as princesses, thought it was cool and kept asking to use her sword. As the mother of a little girl, you wrestle with letting her be who she wants to be and nudging her to “fit in” and it was a huge relief to see that this costume let her do both.